Nicole Saphos is a bassist, singer and composer based in Washington, DC who, like a lot of younger musicians, is willing to mix rock influences into her music as significantly as straight-ahead jazz. On her debut CD, Tiptoe, she fronts a bass-guitar-drums trio in a suite of love songs comprised of standards, originals and a wild card or two and comes up with insinuating and eclectic results. The set starts out with a fleet-footed, pure jazz take on "Just One Of Those Things" with guitarist John Lee comping speedily like Les Paul. Then the rest of the CD files off into different directions. Saphos' own songs like "Broken Ballerina," "Lady Hip's Great Escape" and "Custom Memories" lope along on resonant bass lines and billowing guitar while Saphos sings in a malleable, moaning voice that, at various times, carries traces of Madeline Peyroux, Phoebe Snow andAnnette Peacock. "Doesn't Do" has a steady jazz beat from drummer Ele Rubenstein and an echo chamber of plush, swirling guitar surrounding Saphos' floating siren's voice while Fiona Apple's "Hot Knife" is all double speed patter vocals and tom- tom drumming before the band takes off into a tight instrumental spin. The trio does an ominous version of "Moon Ray" with slow, languid singing, and whining slide guitar, Thelonious Monk's "Ugly Beauty" is done as a sentimental scatted lullaby and "You Don't Know What Love Is" snaps with crisp funky drumbeats, percolating guitar and one of Saphos' most forceful vocals. 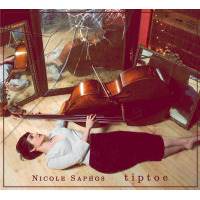 Nicole Saphos has an impressive rapport with her trio and a creative attitude towards her music that leads her to create a uniquely hazy and funky ambiance unlike many vocal jazz CDs. It will be very interesting to see where her talent takes her from here. Track Listing: Just One Of Those Things; Broken Ballerina; Say It Isn't So; Custom Memories; Lady Hip's Great Escape; Hot Knife; Moon Ray; Doesn't Do; Ugly Beauty; You Don't Know What Love Is. Personnel: Nicole Saphos: bass, vocals; John Lee: guitar; Ele Rubenstein: drums.